Chinese soldiers pose for a group photo after participating in the opening ceremony of the ASEAN Defense Ministers' Meeting-Plus Military Medicine-Humanitarian Assistance and Disaster Relief Joint Exercise (AM-HEx 2016) in Chonburi, Thailand on Sept. 5, 2016. THAILAND Sept. 6 (ChinaMil) -- The Second Military Medicine-Humanitarian Assistance and Disaster Relief Joint Exercise (AM-HEx 2016) under the mechanism of the Association of Southeast Asian Nations (ASEAN) Defense Ministers’ Meeting Plus (ADMM-Plus) kicked off in Thailand’s Bangkok and Chonburi as well as waters off its coast respectively on Sept. 5, local time. More than 1,200 military personnel as well as various warships and aircraft from 18 ADMM-Plus member countries, including China, Russia, the U.S. and other ASEAN countries, will participate in the exercise. The AM-HEx 2016 joint exercise will be conducted under a simulated background that after an ASEAN country suffers natural disasters such as earthquake and tsunami, the other ADMM-Plus member countries agree to provide humanitarian assistance. The exercise will consist of two parts, namely command post exercise and actual troop drill. Soldiers from various ADMM-Plus member countries will conduct joint drills on such subjects as engineering rescue, medical assistance, air transportation, maritime search and rescue and so forth. For the five-day joint exercise, the Chinese side has dispatched 120 soldiers consisting of commanding and staff officers, special operations soldiers, an engineer detachment and a medical detachment for the land-based drill. As for the maritime drill, 245 sailors as well as two Mi-171 helicopters and the amphibious dock landing ship Changbaishan (Hull Number 989) with a shipboard Z-8 helicopter will all be involved. Among the Chinese participating detachments, the 50-personnel engineer detachment is from an engineer regiment under the 42nd Group Army of the PLA Army, and the 40-personnel medical detachment is from the General Hospital under the PLA Air Force. General Prawit Wongsuwan, deputy prime minister and defense minister of Thailand, said at the opening ceremony that the AM-HEx 2016 joint exercise is a defensive cooperation achievement with milestone significance under the framework of the ADMM-Plus mechanism. 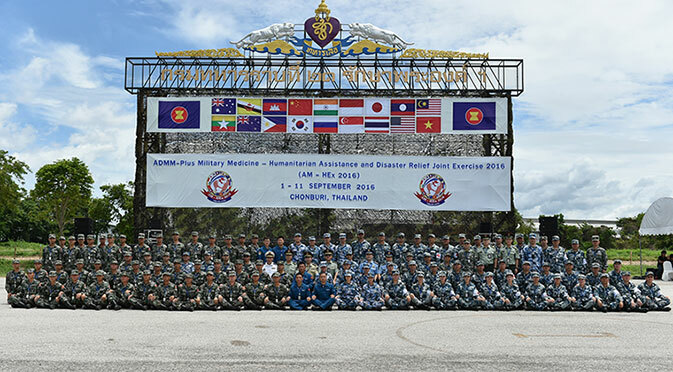 The joint exercise aims to share the experience and strengthen the joint operation capabilities in the fields of humanitarian assistance, disaster relief and military medicine among the ADMM-Plus member countries, Gen. Prawit added. Lieutenant General Chen Zhaohai, leader of the Chinese delegation to observe the joint exercise and deputy commander of the Chinese PLA Southern Theater Command, said that the joint exercise will further level up the mutual trust and pragmatic cooperation between the Chinese military and the militaries of other ADMM-Plus member countries. The AM-HEx 2016 joint exercise is conducive to upgrading the abilities of the militaries of various countries in the region to jointly cope with natural disasters, Lieutenant General Chen Zhaohai added. Soldiers execute missions during the ASEAN Defense Ministers' Meeting-Plus Military Medicine-Humanitarian Assistance and Disaster Relief Joint Exercise (AM-HEx 2016) in Chonburi, Thailand on Sept. 5, 2016.